The same regulations that allow the lake to produce 12-inch bluegill also make the area surrounding it a hiker’s delight. 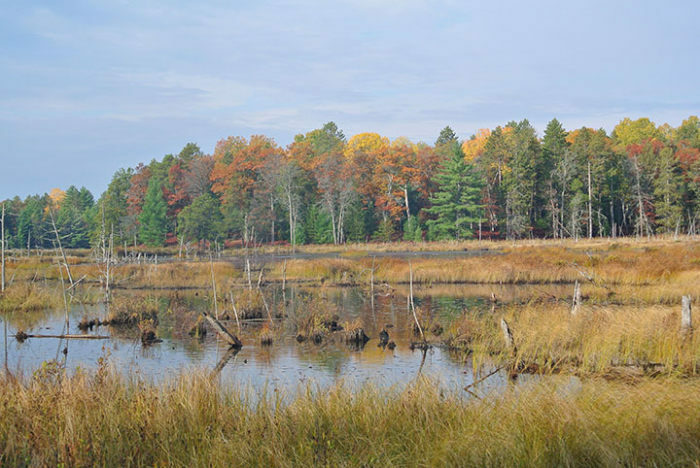 Walk-in access means that there are no motor homes or off-road vehicles in this 2,000-acre tract of the Huron National Forest. On the north side of the parking area, a trail with a locked gate across it heads north to the lake. You quickly pass post No. 1, the junction with the return trail heading west (left), and then in a quarter mile arrive at post No. 2, marking one end of Beaver Pond Loop. 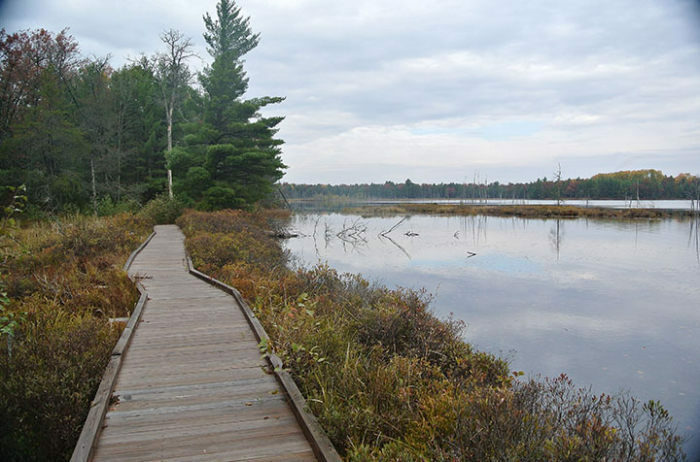 The 0.7-mile spur heads east (right) as a true foot path and loops past a wetland and beaver pond before returning to the main trail. This trek continues north (left) and at Mile 0.4 will reach the lake itself. You enter a grassy area that includes a canoe launch, vault toilet and the camping area. The trail leaves the clearing as an overgrown two-track and swings sharply to the east (right) to the skirt the campground. You quickly pass a junction with a shoreline trail that veers off to the right, then wind arrive at post No. 3 at Mile 0.8, marking the other end of the Beaver Pond Loop. The main trail remains an old two-track marked by blue diamonds and within a quarter mile reaches post No. 4 where it swings northwest (left) to climb a low rise for a view of the wetlands that make up the lake’s north shore. You pass post No. 6 and remain in view of the marshland, birds and Wakeley Lake for a quarter mile until the trail descends to post No. 7 at Mile 1.6., featuring a wooden barrier. Beyond the barrier is the sensitive wildlife area that is closed from Feb. 1 to July 15 when the loons are nesting. If you arrive during that period continue west (right) to post No. 8 and then post No. 9 where you can pick up the Wakeley Alternative Trail that will return you to the lakeshore loop at post No. 10, a trek of 1.6 miles. If you are hiking outside that period then the lakeshore loop continues south (left) beyond the barrier where it crosses an earthen dike between two swamps. You then climb and cross a forested island in the middle of this marsh. The high point keeps you feet dry while providing good views of the lake to the east and the huge cattail marsh to the west. You pass one trail that heads east (left) on along a dike back to the campground area and then come to a second dike heading west. The trail follows this long dike through another stretch of wetlands and then on the other side climbs sandy slope to reached post No. 10 at Mile 2. The Wakeley Alternative Trail splits off to the west (right). The lakeshore loop continues in the southwest direction (left) where it follows a ridge for the next 0.3 mile. Post No. 11 is reached at Mile 2.4 with the lakeshore loop continuing west (left) where it makes a steady climb to leave Wakeley Lake behind. At Mile 2.8 you return to views of the lake that continue for more than half mile as the trail skirts another ridge along its south shore before descending to a long boardwalk. From the boardwalk the trail ascends to post No. 1. 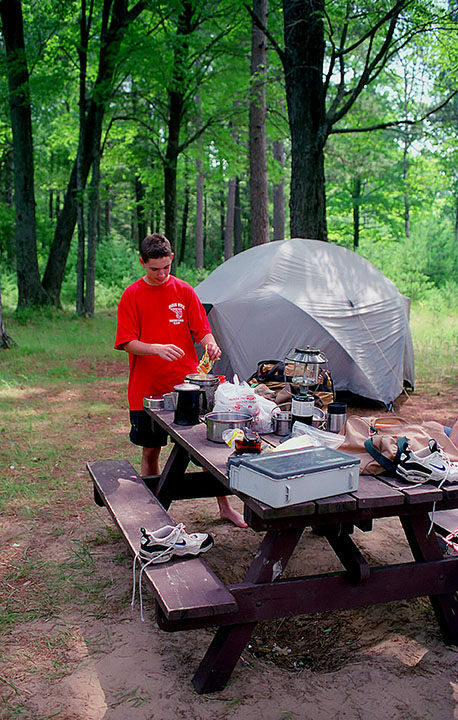 Five walk-in campsites have been set up on a hill on the lake’s east side that makes for the best spot to pitch a tent. There is a vault toilet for the rustic sites but no source of drinking water. At the trailhead there is parking and a display board that includes a self-payment registration area but no source of drinking water. 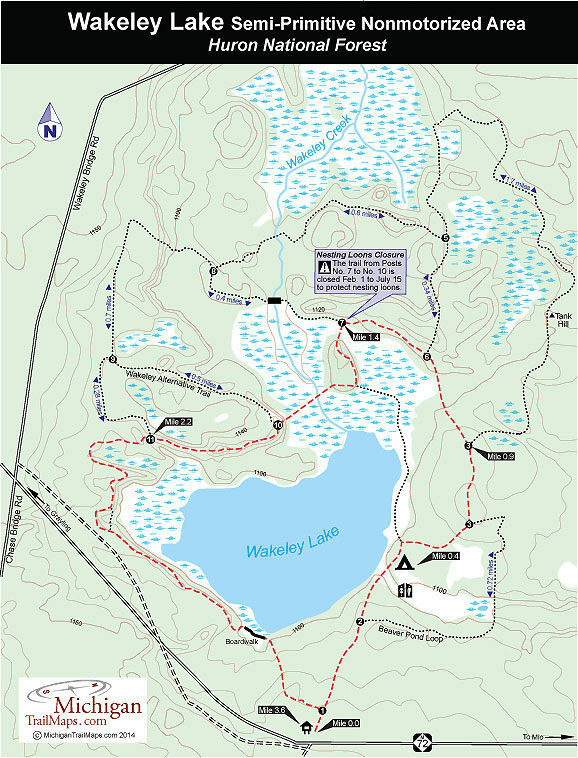 A weekly vehicle permit or an annual pass from the U.S. Forest Service is required to hike, fish or camp at Wakeley Lake. You can pay at the trailhead or if you’re passing through Mio, at the Mio Ranger District office (989-826-3252) on M-72. 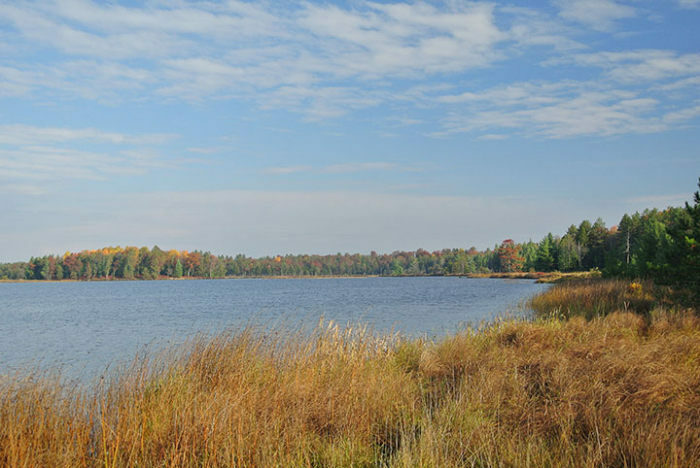 The Wakeley Lake trailhead is posted on the north side of M-72, 10 miles east of Grayling, 22 miles west of Mio, or about a 3.5-hour drive from Detroit. For more information contact the Mio Ranger District office (989-826-3252).